Having trouble remembering the width of a driveway gate? Not sure how much space you need for parking? Wondering how wide to make your front walkway? Find all these dimensions and more on this handy infographic featuring common front yard elements. Landscaping options for enhancing the front of the home abound. You can choose a formal look with a courtyard circling a fountain. Or you can go more natural, with a meandering pathway lined with native plants. You can even create a private space for outdoor entertaining. Whatever you decide, be sure to spend plenty of time determining the look you want and planning how to achieve it. With the help of a landscaping designer to guide you, you'll be sure to get a front yard landscape you love. How they created inspiring front yard gardens, with project profiles from around the country, including a courtyard in California and a modern front yard remodel. Ideas for making over your own front yard, including using walls to add privacy, creating a grand entrance with a wide walkway and arbor, and replacing the lawn with a meadow planted with ornamental grasses and other natural plantings. How to turn a front yard into an outdoor entertaining space, complete with an area for seating and a fire pit. The three components of good entryway design, including planning for vehicle circulation and parking, creating a beckoning walkway to your door, and accenting the front entry. Typical front yard landscape dimensions for entry gates, driveways, walkways, walls, and water features. How to create privacy to separate a front yard from the road and neighbors. Driveway design ideas, including various layouts, material options and decorative accents. The three most important design considerations for front walkways: width, shape and paving materials. Advice on how to choose a walkway style that complements the look of your home. The three main functions of a front porch: to highlight the entrance, provide a protected transition, and serve as a place to relax with friends and family. Front porch designs well-suited for various home styles, including colonial, modern, ranch, and bungalow. Options for enclosing a front courtyard, such as walls, fencing and even plants. 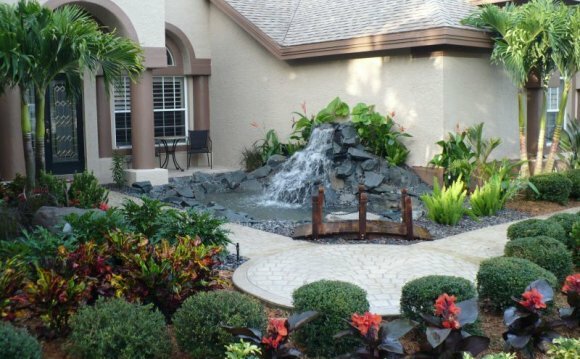 Factors to consider when adding a fountain or other water feature to a front courtyard. Some finishing touches to consider for your courtyard, including furniture, lighting and accent plants.